The EQ Pod System by Innokin is an ALL-IN-ONE kit that has some very awesome features. These great features are sure to make your vaping experience a pleasant and satisfying one. 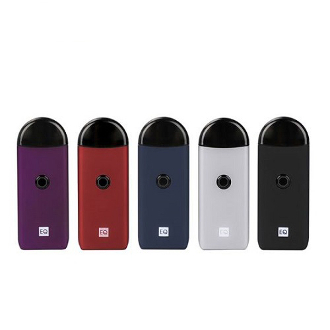 The EQ Pod System has a magnetic refillable Pod that has a 2ml capacity and allows you to fill it with your own liquid. These pods utilize the new Plexus EQ 0.5ohm mesh coils and are designed for mouth-to-lung vapers. The EQ has a built-in 800mah battery that is charged using a USB port on the bottom. The EQ has a very handy LED lit fire button. This is used for two reasons. The first is when the device is turned on and has high battery levels, the LED light will be white. When the LED turns red, this indicates that the battery level is low. When the red LED flashes, this is to let you know that the battery needs to be charged immediately for continued use. The other function of this LED is to let you know which mode you are in. The EQ has a normal mode that fires at 13.5watts. This mode is great for using Nic Salt liquids. In boost mode, the device fires at 15.5watts and works well when using 70/30 VG/PG liquids. To put your device into either mode you must first turn off your device by pressing the fire button three times rapidly. Once the device is turned off, press and hold the fire button to toggle between the modes. In normal mode, the LED will be white and in boost mode it will be red. Once you have set your EQ to the mode you prefer, turn the device back on by once again pressing the fire button three times rapidly.